Goaltenders playing in the L.A. Kings High School Hockey League will have a new resource this season as they try to improve their skills. 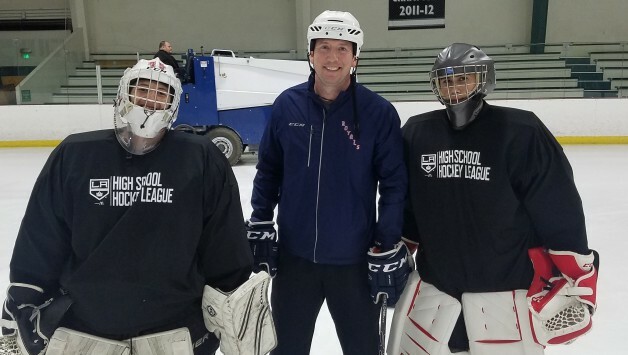 Brian Scullion has been hired as the league’s goalie coach, and will work with each of the league’s nine varsity and eight junior varsity teams. Less than a month into the season, Scullion has already helped a number of the league’s netminders. Scullion had worked as an assistant with the Santa Barbara Royals during the league’s first two seasons, after having coached youth hockey for five years in the Chicago area before moving to California. He helped lead the Royals to two consecutive league championships, and said he jumped at the chance to work with all the league’s goalies, hoping that he could spread his knowledge and expertise to a wide variety of players. Royals coach Steve Heinze, who was a forward in the NHL for 13 years, said having Scullion coach his goalies the last two seasons was a big help, and he expects that the league’s other teams will now benefit similarly. “Our starter and our second goalie were the top two guys in the league in goals-against average both years, so that opened the door for him with the Kings – the proof is in the pudding,” Heinze said. “He’s teaching these guys how to stop pucks. I know nothing about it – I just know how to score. He’s been a huge help with pretty much zero input from me. Scullion developed his coaching approach under the tutelage of current Washington Capitals director of goaltending Mitch Korn, with whom he crossed paths when Scullion was a student at Miami (Ohio) University. In his new role, he involves coaches from each team in his training sessions and takes video as well, with the idea that his lessons can be applied even when he’s not physically with the league’s goalies. The reviews from players and their parents has been nothing but positive. Mark Kovinsky, the father of Burbank Cougars goalie Jake Kovinsky, said the constructive feedback his son received from Scullion far exceeded anything in Jake’s nine years playing hockey. “We appreciate Coach Scullion spending his time with Jake, and we greatly appreciate having coaches that allow the goaltenders to take time from practice to work with goalie-specific coaches,” he said.